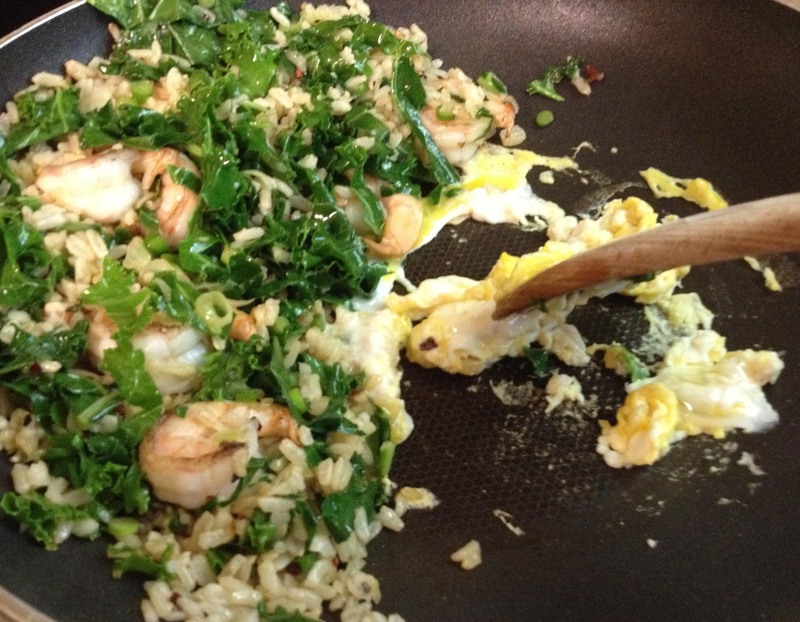 Cook: Shrimp Fried Rice | CookDrinkFeast! I volunteer in a community garden in an area referred to as a “food desert.” Food deserts are low-income neighborhoods that do not have ready access to fresh, healthy, and affordable food. The garden is organic and tended by the neighborhood’s residents, who volunteer their time as part of a kind of ‘sweat equity’ CSA. CSA stands for Community Support Agriculture. Individuals can purchase shares of produce during the growing season. One week, my share consisted of kale, green leaf lettuce, garlic scapes, and collard greens. Garlic scapes are shoots that grow out of the ground from some hard-neck varieties of garlic plants. The stalks must be removed in order for a garlic bulb to form underground. You can use them, as you would green onions, lightly sautéed, stir fried, or sliced as a garnish on top of a dish. I had some leftover rice, which is key for shrimp fried rice. Cooked rice that has been refrigerated for at least 24 hours is ideal for fried rice. The kernels are ripe to absorb the flavors of the other ingredients. I keep bacon fat on had, so I used it to stir-fry the ingredients in order to add another layer of flavor. You can use vegetable oil instead if you like. What do you do when you have an embarrassment of CSA riches? Let me know in the comments below. Break up large clumps of rice and separate the grains. Pat the shrimp dry with paper towels. Heat a wok or large skillet (at least 12 inches in diameter) over high heat. Add 1 teaspoon of bacon fat or oil and heat until it starts to shimmer. 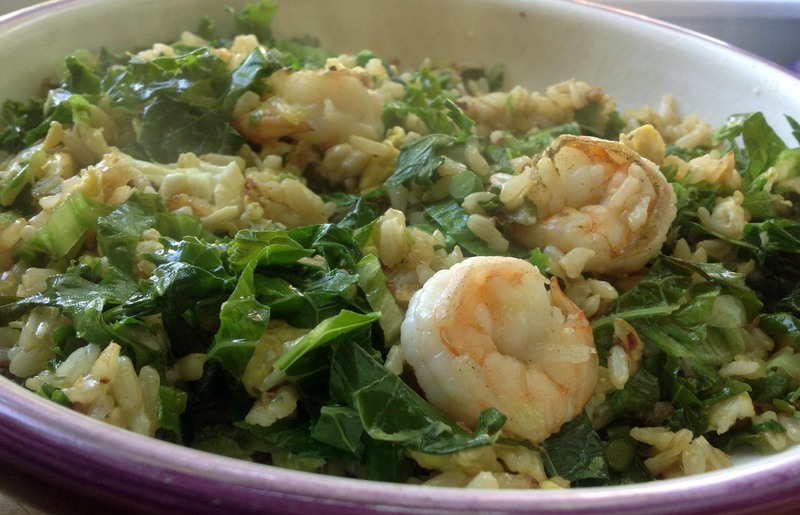 Add the green onion, garlic scape, kale, Stir-fry until hot and fragrant, about 1 minute, then transfer to a bowl. Add another teaspoon of bacon fat (or oil) to the pan and heat until it starts to shimmer. Add the shrimp and stir fry until just cooked through, about 1 minute. Transfer the shrimp to the bowl with the vegetable mixture. Add the last teaspoon of bacon fat to the pan and heat until it starts to shimmer. Sprinkle in red pepper flakes. Stir for 1 – 2 seconds, and then add the rice. Stir fry the rice until it gets hot. Stir in the shrimp and vegetables. Add the soy sauce, cooking wine, and sesame oil. Stir scrambled egg into the rice. Add sliced lettuce and stir in until lettuce wilts slightly. Serve.